The Albion was an O'Neill's from 2000 until just before June 2008, it has been tastefully refurbished and is in the capably hands of Youngs. 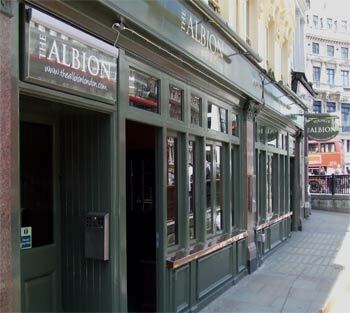 A stones through from Fleet Street, the Albion, which is an ancient name for England, is a tastefully refurbished, modern traditional pub. Dark wood, subtle lighting and real ales accompanied by modern colour's and a selection of varied seating makes this pub worth a visit. Because of the proximately to the road on New Bridge Street it would difficult for smokers to take advantage of outside, there is another bar / function room upstairs. On our visit, Deuchars from the Caledonian Brewery, Youngs and Bombardier were the ale selection, they also have Addlestone's Cider on draught and a good selection of premium lagers (that's funny, looks like an O'Neill's bar!) and of course, Guinness. We enjoyed Youngs on our visit and it was a decent pint, we did not eat but the menu prices where around £7-8 and looked good, the staff are friendly, I would recommond a visit.